Can you get addicted to Ambien? Yes, you can become addicted to Ambien with long-term use. In this article we look at how Ambien affects the body and the risk factors for Ambien dependence. More on signs of Ambien addiction here. Yes. You can become addicted to Ambien. Long-term use of the drug can lead to physical and psychological dependence on Ambien. 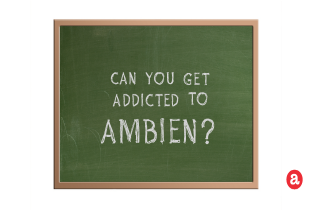 Not only is Ambien a narcotic drug, Ambien is also addictive. But are some people at greater risk of developing an Ambien addiction than others? And what is the difference between a dependence on a drug and an addiction? We’ll look at these questions in more detail here. Ambien is a prescription medication containing zolpidem, a short-acting, nonbenzodiazepine hypnotic. Ambien is used to treat insomnia, or difficulty in falling and staying asleep. Ambien peak time is relatively rapid (1.5-2 hours) and its effects are profound. Because of the risk of developing a dependence to the drug, zolpidem is usually only prescribed for short-term use, usually between 2 and 6 weeks. Longer treatments drastically increase the risk of Ambien addiction. Ambien can be prescribed in tablet form, and there is an extended-release version available as well. Ambien needs to be taken immediately before going to bed, and users are warned not take the medication if they won’t have 7-8 hours of uninterrupted sleep due to the risk of side effects such as drowsiness and memory problems. What does Ambien do in the body? As a sedative-hypnotic, Ambien slows brain activity to allow for easier sleep. Ambien makes users of the medication drowsy and helps them overcome their insomnia. It also works as a muscle relaxant and anticonvulsant, although Ambien has only mild effects in these areas at typical doses. While Ambien is excellent at helping initiate sleep, it has not demonstrated real effectiveness in helping keep people asleep throughout the night. This may be why some of the negative side-effects of the medication can include hallucinations, sleepwalking, and carrying out daily activities (such as driving or preparing food) during sleep. Ambien is also linked to emotional, behavioral, and psychological changes. How do you get addicted to Ambien? Long-term use of Ambien will result in physical dependence. While this isn’t exactly the same as an Ambien addiction, physical dependence means that users will develop a tolerance to the medication and may need to larger doses in order to receive the beneficial effects. However, larger doses of Ambien increase the risk of adverse side effects. People who attempt to discontinue zolpidem abruptly should also expect to experience withdrawal symptoms, which can be serious, including delirium and seizures. Who gets addicted to Ambien? People who have abused other drugs in the past are at an increased risk of becoming Ambien addicts. If you have abused prescription medications or used street drugs, you should not use Ambien. People with a history of drug and alcohol abuse may seek out and abuse other substances while taking Ambien. The best way to avoid becoming addicted to Ambien is to follow your doctor’s advice on dosing, use, and duration of treatment. Ambien should not be prescribed for use any longer than about 6 weeks. Usually, within the first 10 days, the medication will start to resolve insomnia. This is another reason why long-term course of treatment usually isn’t necessary. Again, Ambien should not be prescribed to patients with a history of drug or alcohol abuse, as they are more likely to develop a dependency on the drug. How should you stop taking Ambien? You should talk to your doctor about slowly coming off the drug. You should never stop taking Ambien abruptly. Your doctor will help you develop a plan to take gradually lower doses until you can stop taking the drug completely. If you have any other questions about taking Ambien, please ask us in the comment section. Or send us an email. We try our best to respond to your questions personally and promptly. I have been taking generic ambian for years now (started taking then occasionally then progressed to every night). I take 10mg a night, rarely taking more than prescribed dose. but on occasion I have taken a half tablet more later on during the night after waking up at 3am to use bathroom and not being able to get back to sleep. I have tried to stop using them, but cannot sleep at all without them. Do you have any advice for me I want to quit them in the worst way! I am now convinced by daughter is addicted to Ambien. She is a 100 percent disabled Vet with PTSD and several physical issues. She started taking Ambien over two years ago when she discovered it not only helped her sleep but helped with physical pain. She knows it is not good for her to the point she told her VA Psychiatrist to delete it from her standing drugs. Soon after she figured out how to order it from over seas…she has even stolen from her grandparents. She is the mother of three small children…I don’t know what to do. Intellectually she knows it is bad…she’s taking 3 and 4, 10mg tabs to sleep. She refuses drug intervention help…I am afraid to leave her alone with her children at night…do I go with her to Dr apps and tell them what’s going on. Can I have her committed to a recovery hospital. Any suggestionsuggestions are welcome. Hi Jo Ann. It’s obvious she needs help to deal with the addiction issue, and you need help to deal with her addiction. Please call the helpline number on our site 888-996-6774 to get professionals assist these challenging times. Hi Bob. Thanks for your question. No, you are probably not addicted to Ambien. Addiction occurs after chronic use of Ambien for more than 4-6 weeks at a time. And addiction is characterised by obsessive thinking and craving a drug for its effects, despite negative life consequences of use. To try to get sleep, you might make some lifestyle adjustments, like setting a timer for when you start to go to sleep (instead of when you wake up), avoiding TV or screens for 2-3 hours before bed, exercising throughout the day to make the body tired, or meditation. There are many sleep alternatives to medications that can work if you try them. I used ambien first time user, for a week, scare of side effects stop cold turkey, am i addicted to it, i can’t sleep for 2 days. can i overcome this? Hi Debra. I can relate. I am also in recovery, and one occasion have trouble sleeping. I am very responsive to any kind of central nervous system depressant. And even natural alternatives like valerian or melatonin affect me. So, I think that self-awareness and caution is key to addicts using sleeping pills in recovery. Even though it’s not a narcotic if it’s something that could become addictive, it’s not a good medication for a former addict or in RECOVERY. It’s just not worth the trouble when there are other meds that can perform the same results? ANYTHING that may get a former addict high, they might keep taking it? I KNOW I would, if I was still in my full blown addiction mode? BUT, I wouldn’t do it now. I would choose not to bother with it, just in case! Thanks for sharing your experience, Fran. I hope that others can learn from you and relate so that they might also avoid Ambien addiction. I never did get addicted to Ambien, but I certainly suffered from horrible side effects! I hallucinated and was found acting as if I was awake, when I was not consious of it. It was very frightening and I stopped taking it before I felt any signs of addiction, thank God! I tell everyone I know that I think it is actually a poison.